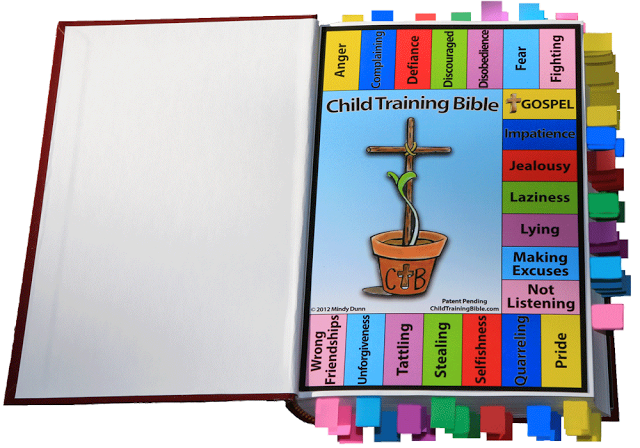 It's the Child Training Bible! I think I just found my summer project! Check out their video tutorial here. I love how we can show children that the answers to all of life's questions really ARE in the Bible (and then find those answers quickly!). We'll definitely be doing this, so I'll give a more detailed post when my project is underway. Excited! If you've already made a Child Training Bible, I'd love to hear what you think about it! This is wonderful!! I can not wait to make one!! Let me know if you do this, B.! I looked this up after seeing your post. I thought...wow...what a great idea and just what I've needed. I even think this would be good at church (with children's classes) because it would definitely take discipline issues back to the Word! Thanks for sharing. I'm going to share this on my blog, too! Oh...and I thought the price was great, too! Bonus! We got this and we LOVE it!! I even bought some to give as Christmas gifts for our friends and family who have kids! It is also great if you have older kids, they can put it together themselves!! Yes, this is a really great tool! They have their Virtues Bible out now, too, that looks just as awesome!